Modern apartment in the heart of the charming neighborhood of Gracia! This is a 45 m2 apartment with capacity for up to 4 guests, with a separate bedroom and a sofa bed in the living room. It is in a new building and its large windows allow sunlight to penetrate throughout the day. In the main bedroom, the apartment has two comfortable single beds, two bedside tables and a spacious wardrobe. The room has a large window. Thanks to its distribution, the kitchen, dining room and living room compose a bright, spacious and modern unit. It has a double sofa adaptable into a double bed with mattress and box spring independent. The recently renovated bathroom is equipped with a large shower, towel dryer and hairdryer. The kitchen, is fully equipped and open to the dining room, has oven, microwave, kettle, toaster, dishwasher and many more supplies to cook for the whole family. The apartment is fully equipped, air conditioning in all rooms, free internet and parking underneath the building (optional service upon request). The building also has a large modern elevator, and the rooftop features a large terrace available to guests. To ensure peace, the floors have security doors, and there are surveillance cameras recording 24 hours around the building. The building Virreina is located in the street Torrent de l'Olla, 161. 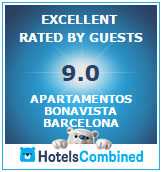 A perfect location for those who enjoy the more local Barcelona. The Gracia neighborhood is known for its small town character, which, incidentally, until 1897 was separated from Barcelona. Gracia breathes another rhythm, has its own soul and special character. In it you can enjoy the contrast of the traditional and the latest trends in Barcelona. Ancient craft shops co-exist with the more advanced proposals. Around the building you can find several supermarkets, bakeries, pubs, bars and restaurants. No need to travel far, 5 minutes by walk you will find everything you need. Less than 15 minutes away you can access the Parc Güell, an incredible legacy of Antoni Gaudí, which is part of the rich heritage of Barcelona. Located 4 minutes away is the metro stop "Fontana" metro Line 3 (green) which takes you to Plaza Catalunya, Las Ramblas and Plaza Spain. The bus line 39 is ideal for a great day at the beach in Barcelona. Walking 10 minutes, is the luxurious Passeig de Gracia, considered to be the "5th Avenue" of Barcelona. Not including tourist tax (2.48 € per person per night). Not including final cleaning (50.00 €).